I arrived in Guangzou, China during a huge heat and humidity wave in September of 2017. Every day the sun would scorch me or drenching rains would pour down with no relief in sight!. At my host, Chen Ya, yoga studio, 26 enthusiastic teachers from all over China greeted me, ready to participate in a 50 hour intensive Advanced Teacher Training Module for Anusara Yoga. 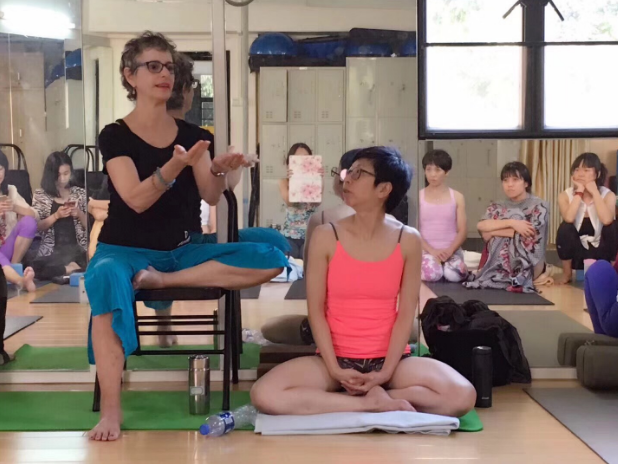 This training was part of a 300-hour yoga teacher training being taught over 12 months at Chen Ya’s studio. Chen Ya’s yoga studio is a beautiful studio filled with light. 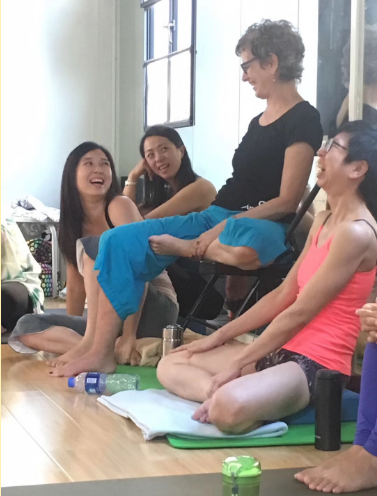 Originally the studio offered facial treatments and massage, but recently Chen Ya shifted her business to teaching yoga and training yoga teachers. A group of Chinese yoga teachers offer Anusara yoga classes in her studio. The downstairs room is a bit darker and is great for the restorative classes that are so popular there. The upstairs room is larger and brighter and mostly used for training teachers and workshops. 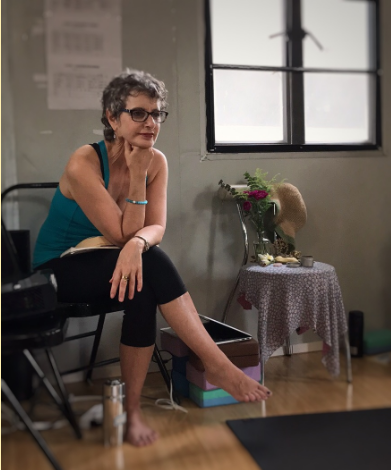 The modules I taught in Chen Ya’s yoga teacher training included 50 hours of Ayurveda, Meditation, how to teach yoga classes with Heart Themes and teaching yoga to Seniors. Prior to the training, I made the decision to use one of the most important Body Thrive habits I learned from Cate Stillman, meditation, as the foundation of the week-long intensive I would be teaching. When the training began, I told everyone to act as if we were on retreat, and do the following, stop drinking alcohol, eat lighter meals at night, go to bed early and get up early. I asked everyone to start and end their day with meditation to assimilate all of my instruction and to prepare for the following day. The regular meditators were on board right away. Non-meditators, not surprisingly, experienced and expressed resistance! Each day I asked who meditated, and every day more and more hands were raised. When we got to the heart theming module, the students realized that meditation actually helped each of them to have the contemplative ability necessary to weave heart language into the physical practice of asana. As the meditation “energy” grew deeper and deeper, the group reported experiencing seeing lights and colors, feeling a vibration and rocking sensations. These experiences are called Kriyas. They occur in deep states of meditation, as meditation energy begins to move in the physical body. I became aware of the powerful Kriya energy moving through the group as the training progressed. One of my meditation teachers, Rudrani Farbman, talks about the field of energy of the kula (sacred community) becoming like a lens for meditation energy or Shakti. If you put a lens over dried leaves, the leaves will catch fire. The lens of shared energetic practice intensifies the meditation energy in a group. Once a student has experienced meditation energy moving inside the begin to awaken to their true essence. Getting a hit of this inner blissful state,they become more and more curious to meditate to find it again. The group began to share their dreams. The meditations were affecting their subtle bodies. One teacher came back after teaching meditation in her class for the first time. She described how it tremendously shifted her yoga instruction. Every day I had the teacher trainees practice teaching meditation to a friend in mediation dyads. Their confidence and love for meditation grew and grew during our time together. The students were asked to bring in stories from their lives and their culture to share with the group in order to learn the art of storytelling. The stories began… “Once upon a time…” A sweet look came upon the yoga teacher trainees as if they were all in Kindergarten gazing upon the teacher reading from a story book. As they got more confident, the trainees practiced telling their stories to the group. Giggles and looks of recognition came upon each of their faces as they found universal themes in everyday circumstances to share with their students. As their confidence grew, humor emerged to bond the group, everyone began to relax and have fun together. An ease settled over the KULA. We were bonding. In the beginning of the training, I learned that a favorite kula member had died over the summer and that not everyone knew of her death. Hannah was 28 only years old and a mother of 2 young children. Tragically she had died of an unusual heart disease. I took time the first day of the training to connect with everyone in the group through a healing circle. We made a puja, an altar filled with sacred items that I brought from home. The altar had Mala beads, a small Nataraja, some healing crystals, Padukhas-the guru’s sandals, a candle and some incense.) I asked people to put items on the puja that had meaning to them. My translator bought Hannah, the deceased student, a sweet woven straw sun hat from Taiwan. We put the hat on the puju and honored Hannah, dedicating our week together as an offering to her. We invoked blessings to her and from her for our gathering. I led everyone in creating a magical pot in which each person put in a word that described Hannah. Some of the words placed in the magical pot were “Sweetness,” “Love,” “Compassion,” “Loving Kindness,” “Steadfastness,” “Adhikara – great studentship.” I told the students to emulate these qualities during the week as a tribute to Hannah. I also told them that embodying these qualities was a way for Hannah to live on through us. As the tears flowed and some of the grief was processed, the group bonded in a deep and authentic way. We dried our tears and felt a renewed rigor in our work together. This is the essence of the first Principle of Ansuara Yoga. “Open to Grace.” Open to the teaching that was already present the moment I walked in the door of Chen Ya’s studio for the training. My job was to guide the Kula to open to their tender-heartedness and their love for their classmate. We were able to turn the grief into a powerful honoring of Hannah’s legacy. When the Ayurveda module began, the students were fascinated. I asked them to take a dosha quiz in Mandarin. I introduced the idea of the Ayurvedic clock to them and asked them to start eating heavier meals during the day and lighter ones at night. Within the group, there were kula members with digestive issues, sleep issues, one cancer survivor, and a few with chronic respiratory infections. Smoking and pollution are the two main causes for respiratory issues in China. The modern Chinese diet has a lot of sugar and salt, causing hypertension and diabetes. The newly prosperous Chinese are now prone to many chronic illnesses, such as obesity and heart problems. These health issues were not as prevalent in China in the past. 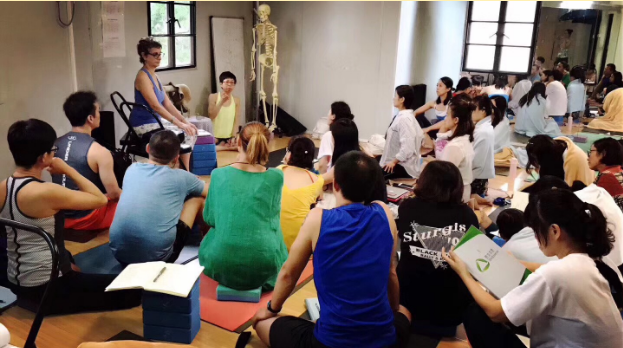 I taught the Chinese yoga teachers many of the 10 health habits of Body Thrive. As a result, the Chinese students in Guangzhou were able begin to understand how to take care of their own health challenges. During that week they shared that they were sleeping better, their digestion felt more efficient and some students were able to quiet their minds for meditation for the first time in their lives. Regular meditators found that their practice deepened and became more fruitful. They had more kriyas and insights about their Sadhana (spiritual path). When I finally got to the ‘Yoga for Seniors’ module, we studied Osteoporosis and Ayurveda. Since many Chinese people do not trust taking medication (I wonder why!!) I was told that because many children have died or have become ill eating formula from China. As a result parents often go to Hong Kong and bring back safer formula from overseas. Medications in China are sometimes tainted with industrial chemicals making people ill. I learned that there is great fear of medications and baby formula in China For this reason, having alternative treatments for Osteoporosis, rather than drugs, was appealing to the Chinese yoga teachers. I taught the traines how to teach chair yoga. One of my students said that Chinese people were skeptical about the causes of Osteoporosis and rebelled against taking medication or doing any weight bearing activity. I assured them that education is the best medicine. I also explained to many of these teachers who are now in their 20’s 30’s and 40’s, that the time to build muscle and bone mass was right now! 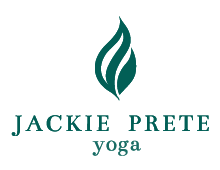 I discovered they loved inversions and were now inspired by the ‘Yoga for Seniors’ module to build muscle and bone to prepare for the aging process and life post menopause. At the end of the modules, they were teaching each other meditation, sharing their heart themes with each other, planning to either teach chair yoga to a relative or start a senior yoga class. All of the students were anxious to delve deeper into the study and practices of Ayurveda. They had conversations about Agni, Ama and Ojas and could really articulate these terms along with the Doshas, the gunas and the 5 elements. I taught them many of the 10 habits of Body Thrive. These habits made a difference in their ability to openly receive the teachings of our week long intensive. It helped the students find that inner opening and trust that allows the heart to “Open to Grace.” Most of the students opened their hearts to the teachings. I did see some resistance. One student who saw herself as very advanced got up to share her heart theme. It needed help. I volunteered to help her outside of the class and invited her to do it over. She not only did not do it over, she did not show up for the rest of the module. She was mortified of having to do it over again. Every other student was able to take coaching in their stride. When it was time for me to say goodbye I felt so fulfilled and grateful for this experience. I hope to be invited back in the next year or so. I am so happy to see this inspired group of Chinese Anusara Teachers moving towards become Licensed Anusara Yoga teachers and spreading the good news of Anusara Yoga, Ayurveda and Meditation in their communities. They now have skills to teach seniors and many new skills to share with their students. For anyone planning to teach yoga and Ayurveda in China, the Chinese students are diligent students. I discovered that by asking questions constantly during my modules forced them to focus and pay attention. I quizzed them throughout the workshop and they loved being tested. They are accustomed to studying very hard. Discipline comes easy for the Chinese student. Give them homework. Spontaneity and creativity needs to be nurtured in them because this is not a skill that Chinese students learn in the formal education system in their country. Chinese yoga teachers are open to discovering the best way to teach and learn easily. Their education system teaches them to study. They are bright and motivated and used to studying hard and really absorbing the material. As a teacher you may need to remind them to turn off their phones and stay alert and focused. I found the students in my training got distracted and start having side conversations. I know they are comfortable with me but I still had to hold the boundaries of the student /teacher relationship. They are affectionate and generous. They wouldn’t let me pay for my meals. They picked me up from the airport and ordered me a car to take me back. Meals arrived at the hotel room the evenings when we didn’t go out and lunch was ordered for us every day. I didn’t have to brave the heat or look for some food at lunch time. I felt like an honored guest and what was even more fun was my discovery that Chen Ya, the owner of the yoga studio and host,, had a tea obsession. One day I had a queasy stomach and she brewed up some special fermented tea that was so soothing. Someone explained that they can digest all the fat in their food because of the tea. Somehow the tea helps them digest the heavy fatty foods. According to many of my friends, Guangzhou is the foodie capital of China. I found the food a bit too heavy for me. I loved the veggies, soups and fish. You had to be careful of bones in the fish dishes. I saw a lot of chicken feet, but did not feel tempted to try eating feet! Chicken feet actually makes their Chicken soup quite tasty!! We ate around huge round tables with a lazy susan in restaurants. Everyone dipping into the serving dishes with their chopsticks. It is no wonder that a cold spread around the community. We share food and germs family style. I surrendered and knew I would probably be taking some kind of cold home with me. Our day of visiting Hong Kong was in the 90’s with over 80 % humidity. It was really uncomfortable. I felt as though I were literally baking in the sun. My translator who was from Taiwan said she came down with some heat stroke symptoms from our day in Hong Kong. We had to spend a lot of the day in a mall as it was smoggy and hot outside. Hong kong is a port built on the side of a mountain. We went up to Victoria Peak to look at the skyline and the day was hazy and sunny. This was the last day of my trip. I could feel a cold coming on. Disturbed sleep, weird diet, and too much Pita energy. I had a great time but couldn’t wait to get back home to the 10 habits and my green smoothies for breakfast. Being out of rhythm while traveling is difficult. I did get to sleep early but would wake up way before dawn every day. As I packed up to come home I felt as though I passed the torch on to next generation of Chinese teachers who want to make a deep impact in their communities. I am beyond grateful for the experience of teaching yoga in China and look forward to my next journey there in 2018 or 2019.. Hopefully I will go at a cooler time of year! Teaching yoga in China has so enriched my life and made me a better teacher . It has given me confidence and valuable experience in presenting new Advanced Teacher Training modules to these enthusiastic students. I look forward to my next adventure. Another Advanced Anusara 300 hour teacher training is being planned for next year. If you are invited to teach in China or anywhere in the world, welcome the opportunity and ‘Open to Grace.’ Let the experience bring you to a new space in your life and your teaching. There will be challenges and amazing gifts. Be prepared and let your deep connection to the Shakti lead the way. I was nervous preparing, but so uplifted by this experience. It is like skydiving. You jump out of the plane and your life will never be the same.